Modern fruit trees are generally grown on a dwarfing or semi-dwarfing rootstock that keeps their size down to manageable levels and can be grown to produce a fairly flat table at a height convenient for picking without ladders. But sometimes we get requests for the traditional old English fruit tree, the sort that grows to an appreciable size and ends up with knarled branches that young children can even climb. An ideal tree for a village green with a good space around the tree to do Maypole-type dancing is the Granny Smith. The fruit hangs on the tree until Christmas without dropping and looks spectacular. However somewhere in a garden nearby there has to be a pollinator… otherwise no fruit! A much better tree for a very large lawn or a village green is a John Downie crab apple. 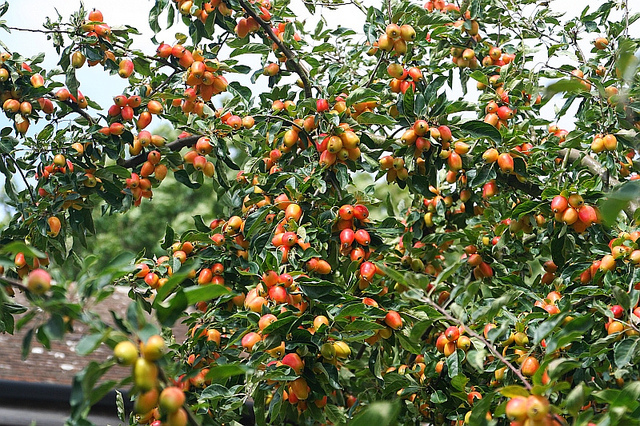 The fruit looks good and makes wonderful crab apple jelly. Whatever your tree requirements, don’t hesitate to contact us for more information and on any special needs you have. And, as they say, the best time to plant a tree was twenty years ago, but the next best time is now, so don’t delay!